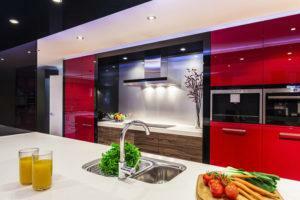 Thinking about remodelling your kitchen? Remodelling is a fantastic way to breath new life into a home, but it can be expensive. That’s why you want to make sure that you get it right and any new addition to your home isn’t just part of a fleeting trend and will still look fantastic in 5, 10 or 15 years. Here are 4 timeless kitchen remodel ideas that never go out of fashion. More open and spacious kitchen/dining areas are here to stay. 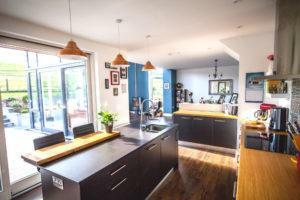 By removing a few walls you create a more comfortable cooking environment because the cook isn’t banished to the kitchen by themselves and the more informal dining arrangements both serve to support a modern casual yet connected style of living. Induction hobs look like they are here to stay and are growing rapidly in their popularity. They heat up pans quickly, they are energy efficient and extremely safe (it’s almost impossible to burn yourself on them, even when they are on full). They also produce much less excess heat than their electric/gas counterparts so even smaller kitchens stay cool while cooking. Not so long ago, LED bulbs gave off a cold blue hue that made them a nightmare for interior designers. However thanks to strides in technology, their future is looking brighter than ever. They are brighter, more efficient and last longer than fluorescent and halogen bulbs and they can be used in so many creative ways around the kitchen like illuminating an island overhang, brightening up work spaces under cabinets and much more. Many LED bulbs now have a lifespan of 50,000 working hours. So even if they were left on for 12 hours every day, you would still only have to change them once every 11 and a half years or so. Marble countertops may be at the higher end of the price scale, but they are something that never goes out of fashion and they can really add a touch of class to your kitchen remodelling project. Marble counters have been popular for so long for a reason and that won’t be changing any time soon. If you’re going to remodel your kitchen and you want to be sure that your beautiful new space won’t go out of fashion with the passing of a season, you should consider going with an open plan layout, using induction hobs instead of electric or gas, incorporating LED lighting and choosing marble as the surface for your countertops. Book your remodelling consultation with Sigma Homes now by visiting us online or by calling us on 021-436-5866.